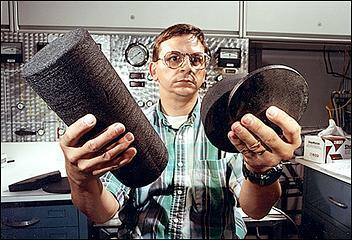 Carbon foam was discovered in 1998 at the Oak Ridge National Laboratory in the US by James W. Klett, a carbon researcher in ORNL's Metals and Ceramics Division. 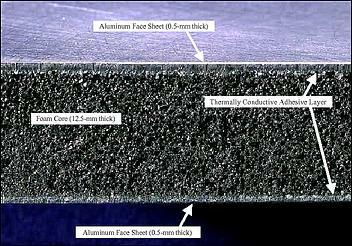 The patented ORNL method for making this special graphite foam has been licensed exclusively to Poco Graphite in Decatur, Texas, which calls the product PocoFoam?. Currently, materials research on the carbon foam at ORNL is being funded by DOE's Office of Transportation Technologies. "This is a truly revolutionary material that will find uses in many applications," says Patrick Davis of the Office of Transportation Technologies. "Specifically, we believe carbon foam is an enabling technology that will solve critical heat rejection problems we must overcome before fuel-cell and advanced power electronics technologies can be introduced into automobiles." Klett says he made his fortunate discovery of graphite foam by accident while changing a fabrication process. "We had been making carbon-carbon composites, which are carbon fibres embedded in a carbon matrix," he explains. "Because of their heat transfer abilities, such composites show promise for making better brakes and heat shields. But we were trying to find a cheaper way to make the composites." Klett was experimenting with a process he modified by eliminating a couple of steps. He noticed that a carbon foam had formed as a result. 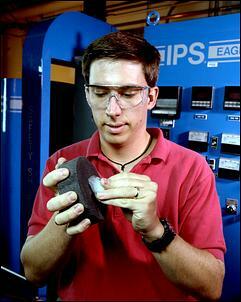 "We usually heat-treat a carbon material to very high temperatures to develop a graphite product," he says. "I took the carbon foam and heat treated it to make it a graphite foam. I then noticed that it transferred heat remarkably fast. When I held the sample in the palm of one hand and pressed an ice cube in tweezers against the top, the heat from my hand caused the ice to melt quickly, cooling my hand. "So Tim Burchell and I made more foam samples, ran heat conductivity tests on them, and confirmed they had a special property. We were the first to recognize that a carbon foam could be made that has unusually high thermal conductivity." Klett and his colleagues found that the key to the foam's conductivity is its unusual graphite crystal structure. It has a skeletal structure full of air pockets, making it only 25% dense and lightweight. The network of ligaments in the foam wicks heat away from its source almost better than high-performance graphite fibres. PocoFoam?, which is three to nine times more thermally conductive than typical lightweight carbon foams, conducts heat better than aluminium but at one-fifth the weight. 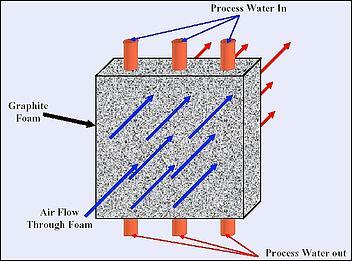 Moreover, the open porosity allows air, water, or some other fluid to pass through the foam. This property, combined with the high surface area, leads to very high heat transfer coefficients in heat exchangers made of PocoFoam?. After the discovery, Klett and Burchell began thinking up applications for the foam. They determined that because the foam is lightweight and transfers heat rapidly, it could improve the efficiency of vehicles. For example, the foam could be used to make a smaller, lighter car radiator that might be placed away from the front of a car to give it an energy-saving and less-polluting aerodynamic design. If the size of the front of the car is reduced, the car will not have to push as much air in its forward motion, allowing it to use fuel more efficiently. Because a smaller radiator can make a car lighter and faster since it allows a more aerodynamic design, automotive racing teams are interested in foam radiators. This radiator would quickly transfer heat from the engine to air blowing through its foam components. In a heat sink made of the foam, hot air or water coolant may pass through a tube penetrating a foam block, and cold air or water would pass through the porous foam. Conversely, the foam can be machined into fins (vertical parallel plates) or vertical pins on a base, as in metal heat sinks. 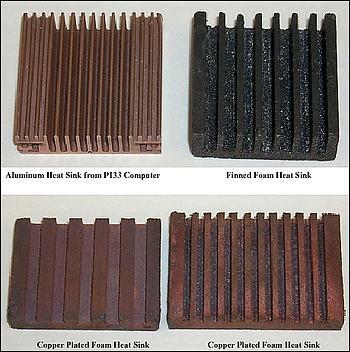 "A subcontractor is now building car radiator prototypes from PocoFoam?," Klett says. "Small radiators could remove heat from fuel cells that will be used to power electric cars and buildings." In cars, the heat from the car radiator could be transferred to warm the passenger compartment. In buildings the waste heat could be recaptured for additional power production. Recently a car radiator was constructed which measured only 230 x 180 x 150mm. With an airflow of 2500 cfm, it dissipated an astonishing 35kW. The Department of Defence is interested in smaller radiators for personnel carriers, Klett says. A smaller radiator would present less of a target to the enemy, making it less likely that it would be hit, effectively stopping the vehicle. PocoFoam? could be used also for cooling brakes, as well as oil and transmission fluid in automotive systems. It could find a place in lithium-ion batteries being developed to power electric cars. "Our preliminary studies show that carbon foam may work better than the typical carbon fibres in the anode of a lithium-ion battery," Klett says. "Our evidence suggests that a carbon foam anode would discharge ions to the electrolyte faster than a graphite fibre anode." PocoFoam? could be used to replace aluminium blocks as heat sinks to cool power electronic modules in hybrid vehicles now being developed. A hybrid vehicle has a petrol engine and an electric motor/generator. The vehicle requires small, lightweight power electronic modules, such as inverters, to convert direct current (DC) from batteries to alternating current (AC) for use by the electric motor in accelerating the wheels. The electric motor becomes a generator when it captures energy from the wheels to slow or stop them. The inverter then converts AC to DC when it takes power from the generator to recharge the batteries. At ORNL a heat sink with fins made of the special graphite foam has been cooling a Pentium 133 chip in a desktop computer since December 12, 1998. "If you reduce an electronic chip's temperature by 10 degrees C," Klett says, "a rule of thumb is that its lifetime will double before it fails." There are other possible uses for foam heat sinks, as well. They may prove useful in protecting electronic components on space satellites from heat damage. Another possible application would be in evaporative cooling, in which the high specific surface area (>4m2/g) combines with the high thermal conductivity to produce very efficient cooling as water evaporates from the foam surfaces. "The aerospace industry is interested in coating carbon foam with titanium to make a high-strength material with high thermal conductivity," Klett says. "The Navy is considering using it for various components to make its boats lighter and smaller." Klett compares the batch method he cultivated to produce graphite foam production to baking a cake. "You put the batter in a pan, stick it in the oven, and heat it to the right temperature until you get a foam," he says, explaining that in essence a cake is a foam. "In our method, we put pitch - tar - in a vessel, pressurise it, heat it, and let it decompose. 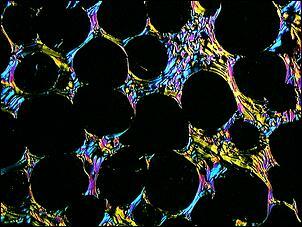 The gas evolved by decomposition during pyrolysis bubbles through the viscous heated pitch, producing a foam." 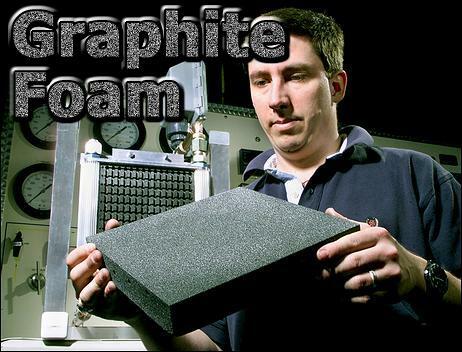 Poco Graphite has an exclusive license to produce graphite foam using ORNL's patented batch method. The company has started production of PocoFoam? in the form of sheets and blocks. Poco Graphite also has the machining capability to produce finished parts made of the foam. The PocoFoam? production process is expensive, but the manufacturer says the price of the product should come down as demand increases. "We're looking at methods that will allow continuous production of the foam," Klett says. "This approach should reduce production time and increase throughput." Klett concedes that PocoFoam? is not exceptionally strong - its tensile and compressive strength and its other mechanical properties are not as good as those of aluminium and copper. "But its compressive strength compares well with some aluminium honeycombs used for heat sinks," Klett says. 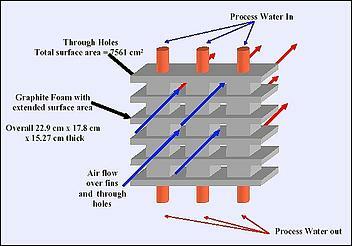 "When we impregnated foam samples with epoxy resin, we found that the foam's compressive strength increased ten times. Nevertheless, we believe that if we tweak the fabrication process to improve the foam's mechanical properties, we would probably sacrifice its high thermal conductivity." Meanwhile, Klett looks forward to making more discoveries as he searches for "out-of-the-box" applications for PocoFoam?. Seeing is believing - watch an ice cube placed on a piece of the foam melt in real time, with all the heat coming from the hand supporting the foam!